Anyone who doesn’t make regular backups of their data is asking for trouble. Of course, the actual process of making backups tends to be a major hassle, which is why I think most people don’t bother. It’s also why I use MozyHome Free, an automated online-backup service that gives me 2GB of free storage--enough to preserve all my most critical files. Well, not all. Obviously that’s not enough space for a photo and/or MP3 collection. But it does cover my Word and Excel files, financial records, bookmarks, Outlook data, and the like. 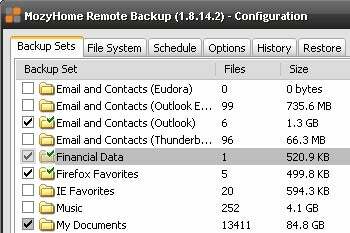 Best of all, the MozyHome software sits in my System Tray and automatically updates my backup at designated intervals. I set it and forget it. If I ever decide to loosen my purse strings (yeah, I said it), I’ll pony up $4.95 per month to get unlimited backup space--similar to the deal offered by competing services like Carbonite and HP Upline. But it would literally take weeks of uploading to preserve all my photos and MP3s, which is why I don’t consider online services practical for archiving media libraries.